I think they're the answer to all study problems. Cause the more sour they are, the more awake you can feel. More awake you are, more you concentrate and are able to pass NCEA. 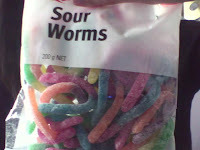 Sour worms are like Coke, except in more colours. So if you're wondering, here is more news on the Paramore front. C4TV say that if you sign up as a VIP, you'll get the info first. There are also ads on tv. All this...but no date. It's definitely trying to bring a lot of hype. All you have to do is read the comments on the C4TV page to see how crazy people are going. On a side note, got a new haircut. It's caused me to keep looking in the mirror at the different styles I can put my hair in now. Some people could see this as a little weird. But it's like "I have new hair. What can I do with it?" Much like when you get a new car (not that I've ever had a car), or a new cellphone (I've got that.) and you look at all the functions, press all the buttons, exploring this new phone/car/hairstyle. New hairstyles are weird too. It's "Not natural" since I haven't had hair like this since...a while ahha. Anyway, I'm still in the middle of exams and studying. Probs should get back to that. Fingers crossed that all Paramore dates will be announced Monday!